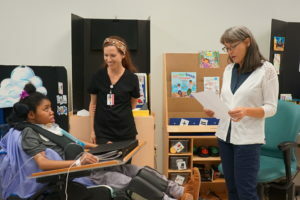 The Oklahoma State Poet Laureate, Jeanetta Calhoun Mish, visited The Children’s Center Rehabilitation Hospital. Mish spent time with the patients by reading poems and helping them write their own poems. Mish visiting the Hospital was an exciting experience for the patients, especially for Greta, who has a love for poetry. “The Children’s Center Rehabilitation Hospital is such a beautiful, loving place. I’m so grateful I got to come here,” said Mish. The Oklahoma State Poet Laureate program is facilitated by the Oklahoma Arts Council on behalf of the governor. The Oklahoma Arts Council works with the State Poet Laureate to coordinate activities and appearances in communities throughout the state. Click here, if you are interested in donating to the education department at The Children’s Center Rehabilitation Hospital.